Little did my mom know, that when she declared the Christmas of 1971 as a “Handmade Holiday”, she changed my life forever. The notion that my family took the time to create gifts for each other has had a lasting impact for me. I can still remember feeling so honored and loved that even my dad, who was Mr. Busy and Mr. Uncrafty, spent time putting together presents he thought we would enjoy. The huge mosaic he made from our shag carpet remnants, hung on the wall above the piano for years. The fabric covered hanging lamp he made for me, hung above my bed until I went to college. It was this Christmas that began my own “Handmade Journey”. I became a quilt makin’, pot throwin’, furniture restorin’, clothes sewin’, scrapbookin’ fool. You name it, I was trying to make it. Needless to say, I’m still on my “Handmade Journey”. It has become such a part of who I am today. All seems right with the world when I’m able to design, create and share my sewing adventures with you. I was thrilled when the editors at eHow asked me to create a slide show tutorial for their gift guide of stylish DIY projects. I knew just what to do for you! 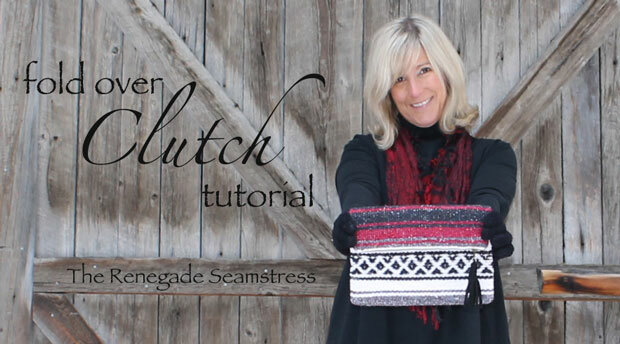 You can upcycle an old thrift store blanket into this beautiful clutch in under an hour. This project is a perfect DIY holiday gift that is both affordable and practical. Your friends and family will appreciate the fact that you spent the time to make them a unique, earth-friendly gift this season. Even beginning sewists will be able to create this fun clutch. You were so kind and left so many comments over at eHow on my last two projects, so I’d like to give this clutch away, too. All you have to do to be entered to win, is head on over to this clutch tutorial, scroll through the slide show and leave a comment. I will choose one lucky winner on Saturday, November 30. Thank you, once again, for being so supportive!! PS. The winner of the crochet shrug will be announced tomorrow. This entry was posted in Uncategorized and tagged clutch, DIY, fashion, giveaway, reconstructed clothing, recycling, Refashion, Sewing, Thrifting, upcycling. Bookmark the permalink. fun and unique! 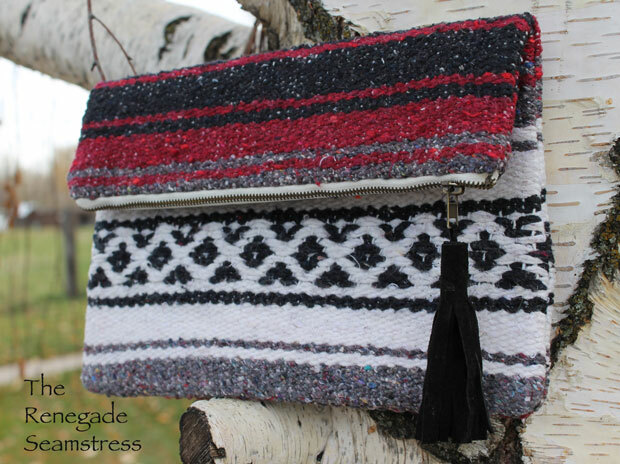 I never would have thought to use a woven rug to make a clutch purse! Thanks, Cathy! It’s actually a woven blanket, but a rug would work, too. I’m your biggest fan!!! Love your finished product. Thanks for what you do making remakes classy. Awwwwwwww…..thanks, for your sweet comments, Michelle! You made my day! Love it! We should do a homemade Christmas this year! I love love love this idea and the gorgeous woven rug you used in your tutorial! And the idea of a homemade holiday…now that is inspired. Might have to implement that this holiday season! Thanks so much, handmade holidays can be so meaningful!! I love handmade Christmas gifts. It makes me feel so special that someone would but the time in to make something just for me. And I love to make things for those special people in my life too. Also make dresses for Haiti and toys for Sally’s house. Isn’t that what Christmas is all about? Marla, thanks for all the good you are sending out into the world!!! Blessings! What a great idea for a bag! At first glance, I didn’t think it was really my style, but the more I think about it, the more I see the design possibilities- the different directions this could go, depending on the materials you start with. Oh yes, just changing a few things would give it a whole different feel. Thanks, Desarae! Yes, by changing the fabrics you could make it dressy, casual, practical, or just plain fun. Let me know if you try it, I’d love to see your version of this. I’ve been making a handfull of clutches this past week and THIS was not one the styles……I think I need to add it to the group!! I love it!! Such a coincidence, Roschelle! I hope you’ll try one, they are super easy and would make a nice gift. I really like this! I have been making your zippered pouch design with great success, so I hope to make a clutch equally easily. Thanks for your great ideas, Beth. Hi Jo! The technique for this is identical to the zipper pouch. You just use different dimensions. Happy sewing!!! Thank you, Katherine. I can’t wait to see your version of this clutch! I loved this clutch….will head on over and make a comment…..wish me luck! Thank you, Louisa! Good luck!! Enjoyed the tutorial….but unable to leave a comment on the e-how site…..such a confusing place!! Hi Cathy, I think you have to have a Facebook account in order to leave a comment. Thanks, Mari! Cooper took those photos up at Linda’s cabin in front of the wood shed. 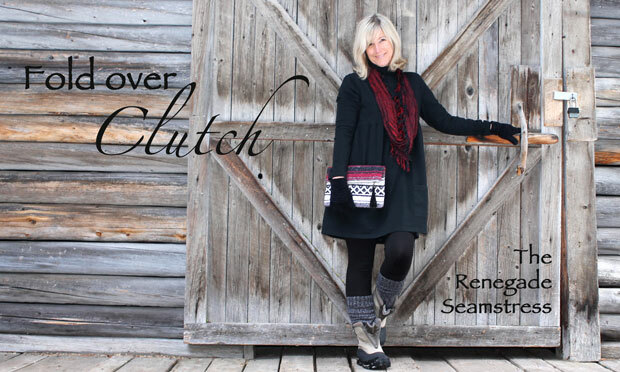 The clutch is really cute, Beth! I wasn’t that big fan of the crochet top, but this is adorable! This is so cute! You do an excellent job on tutorials, I especially like the tassle! Thank you, Millie! I’ve wanted to try a tassel for a long time. It was super fun and easy to make. Love, love, love it. We are in the process of making this a mostly homemade Christmas. All your ideas are super wonderful and can’t wait to try the clutch! Thanks, Carole! A “mostly homemade” Christmas is a perfect idea!! Happy holidays!!! It turned out lovely. The colors are wonderful! I do have one of the blankets my DD brought back from Mexico… I could make one myself… but you know, it always seems I’m always sewing something else. I don’t Facebook so i guess I can’t enter. I’ll put your name in the hat, too. Thanks for all of your nice comments!!! Thanks Beth… that was sweet of you. You are so welcome, Nora. I’m sorry the comment didn’t work for you over there. I will put your name in the hat, too. Thanks for your nice comment! That would be great! Very thoughtful of you, I appreciate my name being added! Hey Neighbor! The closest I’ve been to Grants Pass is Lake of the Woods. It was beautiful there. Have fun with this project, it really is quick and easy! keep your ideas coming, I so appreciate your sharing them. It makes my fingers itch to make them all. Awwwwww……thanks so much for your wonderful comments! It’s people like you that make this all worthwhile! I’ve been playing with quilted pillow shams — they make a soft unique bag or purse. I’d love to see your tutorial on this clutch bag. Thanks! Great tutorial!! Great idea!! I can not wait to make one for my friend and one for myself!!! Awesome!! Thank you Rhonda! Have fun!